Photo: Daniel Day-Lewis, Oscar winner for performance by an actor in a leading role for his role in “Lincoln”; Jennifer Lawrence, Oscar winner for performance by an actress in a leading role for her role in “Silver Linings Playbook”; Anne Hathaway, Oscar winner for performance by an actress in a supporting role for her role in “Les Misérables”; and Christoph Waltz, Oscar winner for performance by an actor in a supporting role for his role in “Django Unchained” pose backstage with their Oscars during the live telecast on the ABC Television network from the Dolby Theatre in Hollywood, CA, Sunday, February 24, 2013. Credit: Matt Petit. © Academy of Motion Picture Arts and Sciences. 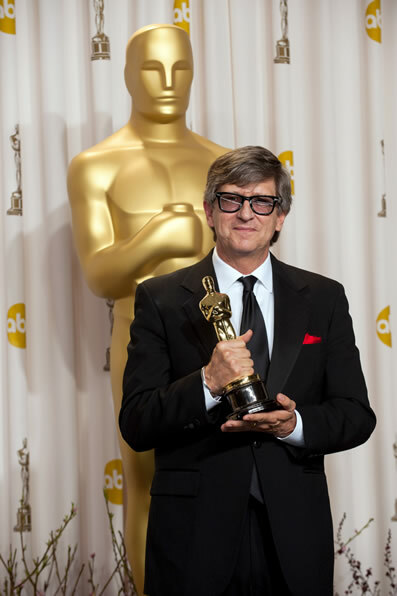 Photo: After winning the category of achievement in production design for work done on “Lincoln”, Rick Carter poses backstage in the press room during the live ABC telecast of The Oscars from the Dolby Theatre in Hollywood, CA, Sunday, February 24, 2013. Credit: Heather Ikei. © Academy of Motion Picture Arts and Sciences. 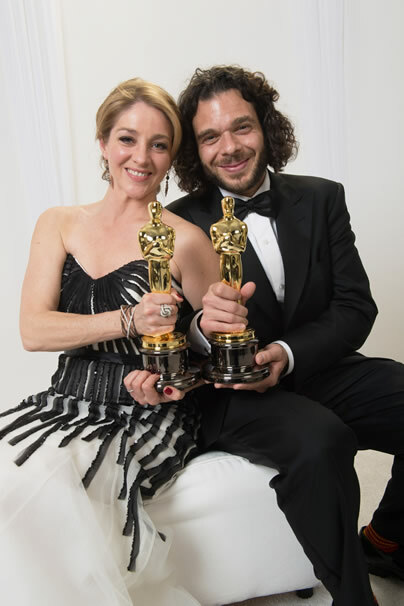 Photo: Winning the category best documentary short subject for “Inocente”, documentarians Andrea Nix Fine and Sean Fine pose backstage for the press with the Oscar during the live ABC Telecast of The Oscars from the Dolby Theatre in Hollywood, CA, Sunday, February 24, 2013. Credit: Todd Wawrychuk. © Academy of Motion Picture Arts and Sciences. Photo: Oscar nominees (from left to right): Jennifer Lawrence and Hugh Jackman at the Oscar Nominees Luncheon in Beverly Hills Monday, February 4, 2013. The 85th Academy Awards were presented on Sunday, February 24, 2013 at the Dolby Theatre at Hollywood & Highland Center, and televised live by the ABC Television Network. Credit: Todd Wawrychuk. © Academy of Motion Picture Arts and Sciences. 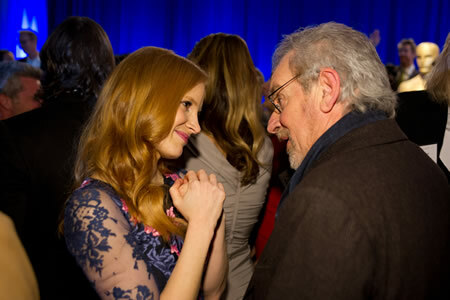 Photo: Oscar nominees Jessica Chastain and Steven Spielberg at the Oscar Nominees Luncheon in Beverly Hills Monday, February 4, 2013. The 85th Academy Awards were presented on Sunday, February 24, 2013 at the Dolby Theatre at Hollywood & Highland Center, and televised live by the ABC Television Network. Credit: Michael Yada. © Academy of Motion Picture Arts and Sciences. 15. Original Score: “Life of Pi,” Mychael Danna. 16. 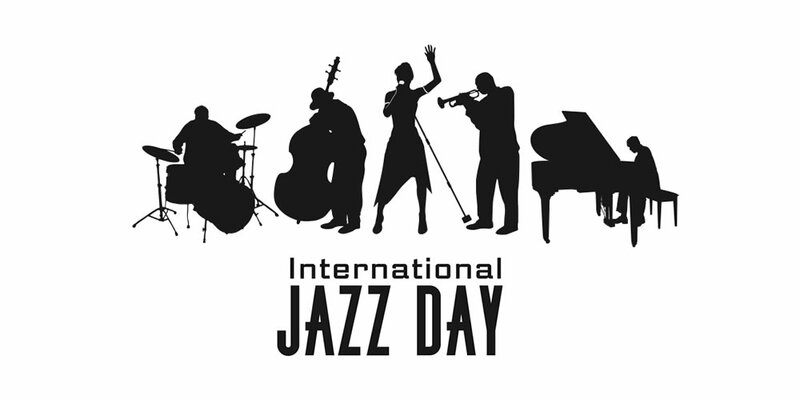 Original Song: “Skyfall” from “Skyfall,” Adele Adkins and Paul Epworth. Academy Awards for outstanding film achievements of 2012 were presented on Sunday, February 24, 2013, at the Dolby Theatre at Hollywood & Highland Center, and televised live on the ABC Television Network. The Oscar presentation was also televised live in more than 225 countries worldwide. Globally renowned exhibit of rare and unseen automotive treasures from bygone days — At The Taj Lands End, Mumbai, India. Photo: 1930 Austin 7 Ulster on display during the Pre Judging of the Cartier ‘Travel With Style’ Concours 2013 Opening at Taj Lands End on February 9, 2013 in Mumbai, India. (Photo © Aditya Kapoor/Getty Images for Cartier). 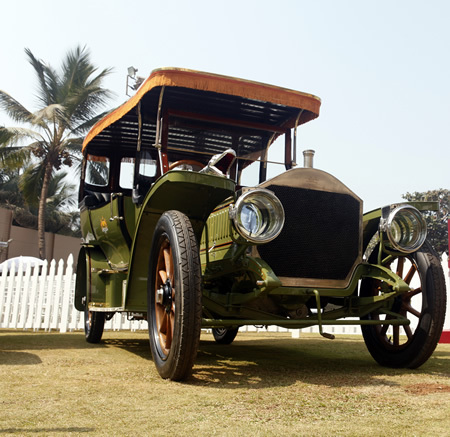 Photo: 1906 Napier type L76 at the Cartier ‘Travel With Style’ Concours 2013 at Taj Lands End on February 10, 2013 in Mumbai, India. (Photo © Aditya Kapoor/Getty Images for Cartier). Photo: 1912 Rolls Royce Silver Ghost on display at the Cartier ‘Travel With Style’ Concours 2013 at Taj Lands End on February 10, 2013 in Mumbai, India. (Photo © Aditya Kapoor/Getty Images for Cartier). Mumbai played host to one of the world’s most prestigious automotive events - The Third Cartier Travel with Style Concours d’Elegance 2013. 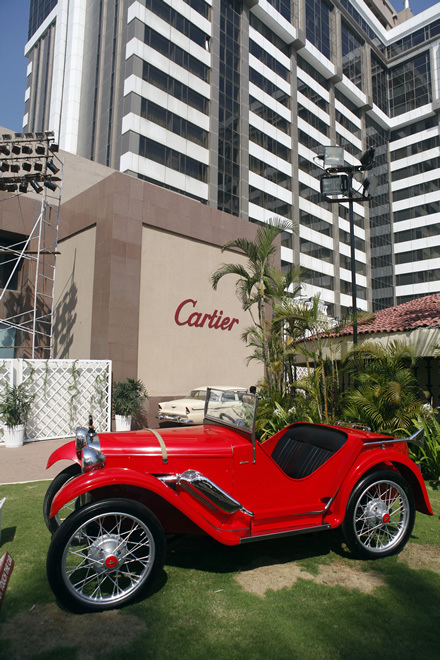 Cartier ‘Travel with Style’ is among the world’s best four Concours d’Elegance - a one of a kind vintage car exhibition and competition held every two years in India. 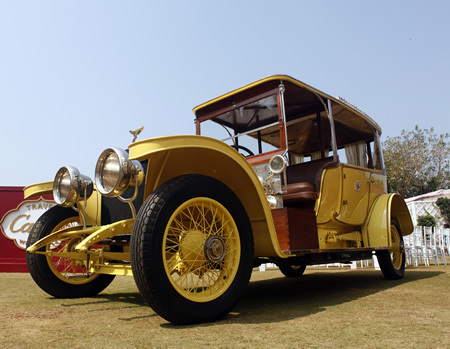 This year, amidst the opulence of over 100 of the rarest automobiles from the esteemed stables of Indian royal patrons and noted private collectors, guests mingled over lunch and high tea at a specially curated exhibition space spread across the lawns of Taj Lands End. The distinct exhibit culminated with an award giving ceremony hosted by Master of Ceremony Mr. Alan de Cadenet. The Best Car of the Show was Rolls Royce 1935 Model No: Phantom II owned by H.H. Maharaja Gaj Singhji of Jodhpur. Photo: Turning 30. Birthday Party. Photographer - Sarai Rua Fargues. 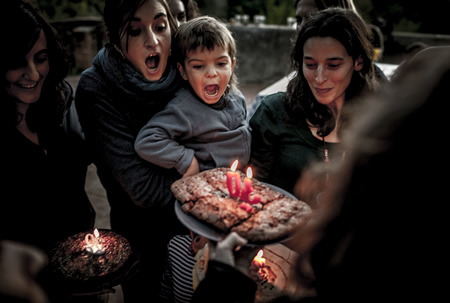 © Sarai Rua Fargues, Spain, Student Focus Finalist, 2013 Sony World Photography Awards. Photo: Jackpot. 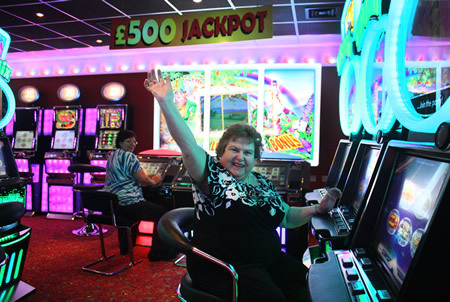 Grandmother on a slot machine. Photographer - Aimee Turner. © Aimee Turner, UK, Student Focus Finalist, 2013 Sony World Photography Awards. 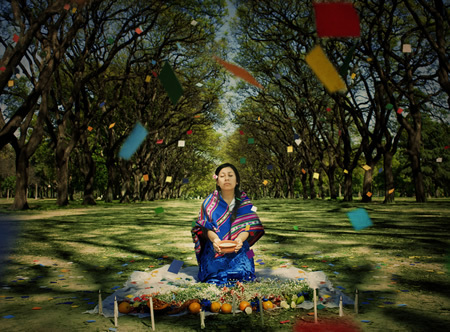 Photo: Offering colors to Pachamama. Celebration of Pachamama — a festival celebrated by the original Andean peoples of Latin America. Photographer - Maria Candelaria Rivera Gadea. 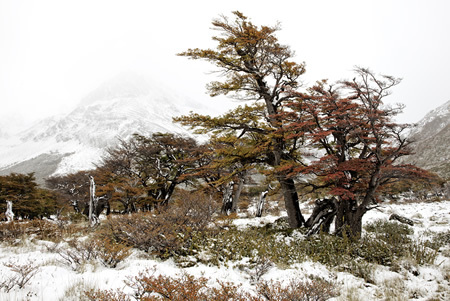 © Maria Candelaria Rivera Gadea, Argentina, Student Focus Finalist, 2013 Sony World Photography Awards. • The World Photography Organisation (WPO) today revealed the ten finalists of the 2013 Sony World Photography Awards Student Focus competition. • Over 230 universities entered this year’s Student Focus, which has established itself as the globe’s leading student photography program and competition and involves over 20,000 students. Photographers were asked to enter a single image to capture the spirit of celebration in their country. The judges, photography collector, curator and consultant W.M Hunt plus British photographers Jonathan Worth and Leonie Hampton, were asked to select six images from the six continents, plus four favorites from anywhere in the world to make a list of 10 finalists from the entries. • All will now compete to win the overall Student Focus title and €35,000 worth of Sony digital imaging equipment for their university. All student finalists will have their images exhibited at Somerset House, London, as part of the 2013 Sony World Photography Awards Exhibition from 26 April - 12 May. The photographs will also be published in the 2013 edition of the annual Sony World Photography Awards book. The finalists also receive a Sony 65 camera on which they will shoot a series of images exploring what the word ‘family’ means to them; the judges will select an overall winner from these images. All students will be flown to London by WPO to find out who has won the 2013 Student Focus title and €35,000 worth of Sony digital imaging equipment, when it is revealed at the glamorous Sony World Photography Awards Gala Ceremony on 25 April. • Following its inaugural Student Focus conference on photography education held at Photokina in October 2012, the World Photography Organisation and Sony are publishing a white paper on the future of the education of photography. • Written by Virginia Morrison, Executive Director, Society for Photography Education, USA, the white paper outlines a series of core competencies for students of photography, a key element missing from the current system of teaching. It also addresses photography curriculum, the need to think digitally and the making of and teaching of the art of photography. Photo: Models pose on the runway during the 2013 International Woolmark Prize Final at ME London on February 16, 2013 in London, England. (Photo © Dave M. Benett/Getty Images). 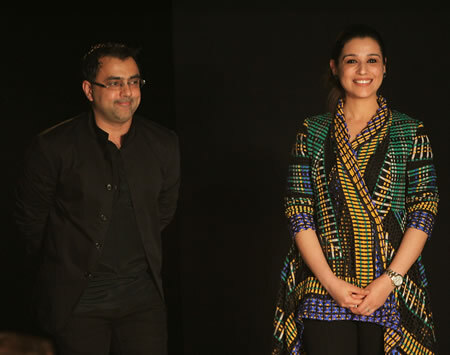 Photo: Designers Pankaj and Nidhi, India, take a bow after their runway show during the 2013 International Woolmark Prize Final show at ME London on February 16, 2013 in London, England. (Photo © Dave M. Benett/Getty Images). Photo: A model walks the runway during the 2013 International Woolmark Prize Final show at ME London on February 16, 2013 in London, England. (Photo © Dave M. Benett/Getty Images). 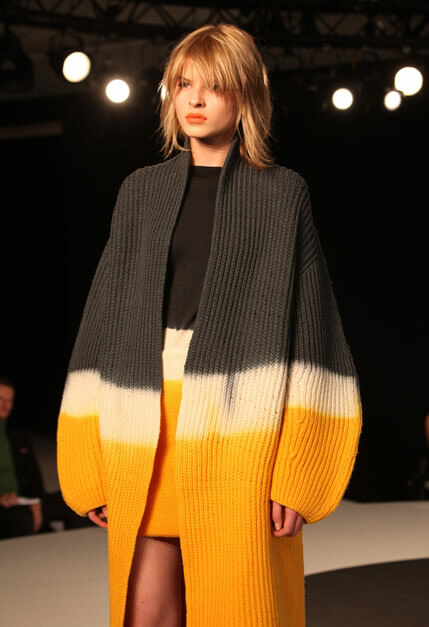 Christian Wijnant was announced the winner of the 2013 International Woolmark Prize, during the final award event held at the ME Hotel, London, on Saturday, 16th February. Natalie Massenet, Chairman of the British Fashion Council opened the event; a judging panel including Victoria Beckham, Donatella Versace, Diane von Furstenberg, Franca Sozzani and Tim Blanks selected the winner. After a global search spanning twelve months, reaching across sixteen countries and involving over seventy designers, six finalists representing Australia, China, Europe, India, Japan and the USA competed for the final international prize - of $100,000 AUD and the opportunity to be stocked in the most important boutiques around the globe including Harvey Nichols - London, Bergdorf Goodman - NY, 10 Corso Como - Milan, Joyce - China, David Jones - Sydney, and Eickhoff Konigsallee - Germany. Photo: Landscape. Colors of Patagonia. © Sandra Herd, Australia, Shortlist, Landscape, Professional Competition, 2013 Sony World Photography Awards. Photo: Campaign. U.S. President Barack Obama speaks in the rain during a campaign rally in Glen Allen, Virginia. © Brooks Kraft, United States, Shortlist, Campaign, Professional Competition, 2013 Sony World Photography Awards. Photo: Portrait. Ethnic Minorities in Western China. © Li Fan, China, Shortlist, Portraiture, Professional Competition, 2013 Sony World Photography Awards. Photo: Travel. A journey through the winter in Norway. © Agurtxane Concellon, Norway, Shortlist, Travel, Professional Competition, 2013 Sony World Photography Awards. Photo: Architecture. Graphic B&W shot of the Sea link in Mumbai. © Dilip Bhatia, India, Shortlist, Architecture, Professional Competition, 2013 Sony World Photography Awards. The World Photography Organisation today announced the shortlists for the Professional, Open and Youth categories of the 2013 Sony World Photography Awards. With 122,000 entries from 170 countries - the highest number of submissions to date - the judges have selected a shortlist of photographs that stood out beyond all others for their impressive high quality, originality and modern appeal. “The World Photography Organisation is dedicated to finding the best international contemporary photography from across the world. 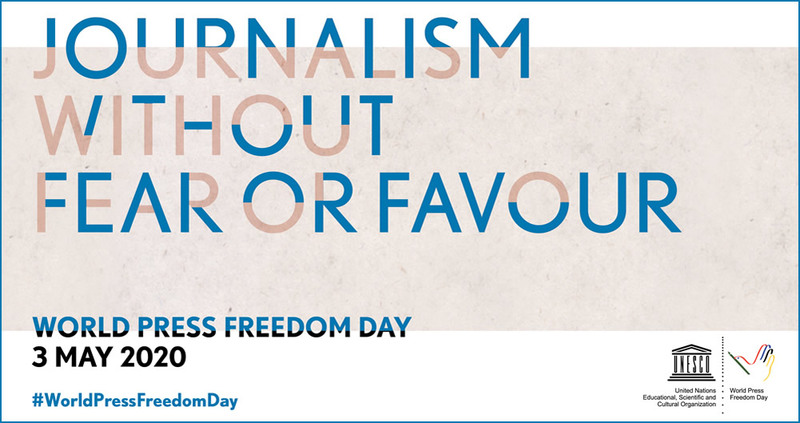 The shortlist is a clear indication of the exciting photography which is out there and, as we do every year, we are looking forward to presenting this collection of photographers to a global audience,” said Astrid Merget, Creative Director of the World Photography Organisation. The work of all the shortlisted photographers will be exhibited at Somerset House, London, from 26 April - 12 May as part of the 2013 Sony World Photography Awards Exhibition. The images will also be published in the 2013 edition of the Sony World Photography Awards book.